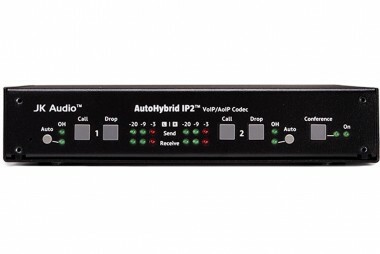 The AutoHybrid IP2™ Remote jack allows easy connection to the JK Audio Interchange™ Intercom Phone Bridge, offering an auto-answer VoIP connection into your party-line intercom. Low power consumption for Power over Ethernet (PoE) applications. External power supply included for LAN connections without PoE capability.